"I have been looking for a good Russian Black Bread recipe. This one is the closest I have come. The vinegar adds a bit of a bite, but believe me, with cheese it is marvelous." Place ingredients into the bread machine in order suggested by the manufacturer. Use the whole wheat, regular crust setting. After the baking cycle ends, remove bread from pan, place on a cake rack, and allow to cool for 1 hour before slicing. To make this recipe in a stand mixer, combine all of the ingredients except the softened butter in the mixing bowl. Mix on low speed using the dough hook, scraping the dough down occasionally, for 10 minutes. Add the softened butter and mix for an additional 5 minutes. Transfer the dough to a greased bowl, cover it with plastic wrap and a kitchen towel, and allow it to rise until doubled, about 1 hour. Grease two 9x5-inch loaf pans. Deflate the dough and turn it out onto a lightly floured surface. Divide the dough in half. Flatten the dough pieces into rectangles, pressing down with your hands to pop any air bubbles. Fold the dough into thirds, rolling it slightly under your palms to form a loaf, and pinch the seam to seal. Place the loaves into the loaf pans, seam-side down, cover with a floured kitchen towel, and allow it to rise again until doubled, about 30 minutes. Bake the loaves in a preheated 400 degree oven (200 degrees C) until the crust is dark and the bottom of the loaf sounds hollow when tapped, 25 to 30 minutes. Remove the bread from the pan and cool on a wire rack. 10-22-07 I made this loaf expecting a strong rye flavor and was disappointed. However, it was tasty, just not "rye enough" for me! 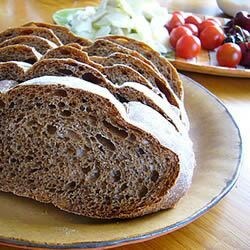 I bought Russian black bread and loved it.....this recipe is even better and so easy to make in a bread machine. It is the perfect bread to serve with a hearty soup...especially borscht! I made this recipe into rolls and baked them in my oven; they are excellent!